Emory’s new Degree Tracker tool is designed to empower students with an interactive degree audit report that clearly lists courses completed and in progress, along with listings of courses that would satisfy outstanding requirements. Degree Tracker is now accessible through OPUS and provides undergraduate students, department administrators and faculty advisors with interactive reporting of each student’s progress toward completion of graduation requirements. 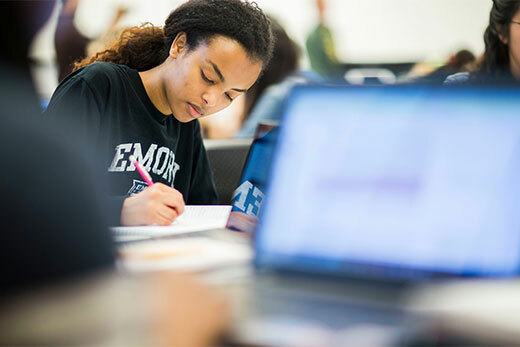 Last fall, Emory’s Office of the Registrar released the initial phase of Degree Tracker to Oxford College, Emory College of Arts & Sciences, Goizueta Business School and the Nell Hodgson Woodruff School of Nursing. This first phase resulted in fully built modules for general education program requirements (identified as GERs or GEPs) and most major and minor programs. Degree Tracker has been designed to empower students with an interactive degree audit report that clearly lists the courses completed and in progress (including which ones will satisfy graduation requirements). Degree Tracker also provides accurate listings of courses that can be used to satisfy outstanding requirements. “The new Degree Tracker offers functionality that makes undergraduate advising easier during each year of students’ studies,” says Shari Obrentz, associate dean of Emory College’s Office for Undergraduate Education (OUE). Valerie Molyneaux, associate dean for academic affairs at Oxford College, believes the first- and second-year students she and her peers support will significantly benefit from the standardized information on the Degree Tracker, which aligns well with Oxford’s commitment to holistic faculty advising. “In combination with the What-If platform, students and advisors in Oxford and Atlanta can be on the same page about requirements, allowing them to spend more time on the most vital work of the advising relationship: meaningful dialogue about the individual student's academic, personal and professional aspirations." Barbara Shannon, undergraduate coordinator for Emory College’s biology department, has been working with the Degree Tracker team on user testing since summer 2018. She notes there are still some aspects of Degree Tracker which need to be refined, but she feels confident “this tool will be a wonderful feature for myself, as well as for the students.” In particular, Shannon used Degree Tracker to verify program GPAs for the Fall 2018-Spring 2019 Biology Honors Program cohort. Marvell Nesmith, co-director of registrar’s services for Goizueta Business School, says Degree Tracker offers multiple benefits for the bachelor of business administration (BBA) program in particular, including a more streamlined exceptions entry process and the ability to view a student’s progress against GERs. An additional feature of Degree Tracker is the “What If” reporting platform, which allows students to see how classes they have already taken and are currently taking compare to requirements for majors and minors other than those currently declared. This feature can be especially helpful for first- and second-year students who have not yet declared, as well as for juniors and seniors exploring a change from one major to another or considering adding a second major to their studies. Now, with Degree Tracker, students from any other undergraduate program can explore another school’s requirements before deciding on a specific path of study. The Degree Tracker team released a platform update on March 19 which includes a new requirement status category – “Satisfied with In Progress Courses”. This feature allows Degree Tracker users to easily view requirements which are almost complete separately from those that are already satisfied. The Registrar’s Office is also currently working alongside undergraduate programs to identify and resolve any courses which currently do not appear under Degree Tracker requirements as expected. “Moving forward, departments will be able to proactively identify any anomalies as a student is just beginning to take a course and reclassify these records on their own,” says JoAnn McKenzie, university registrar. Ultimately, Degree Tracker will be used to verify degree completion and certification. The Registrar’s Office is confident the tool will foster more engagement and richer conversations between students and their advisors, ultimately improving on-time graduation rates for the university’s undergraduate programs. Faculty, staff and students can visit the Registrar’s website for more information on Degree Tracker, including training resources and support contacts.